Part of being in a small college was that not only do you make great meaningful relationships with but also with the community that supports the college— professors, administrators, and people that live in the city. My research professor and I were so close. She helped me out my personal love life and I helped her expand her palate by taking her out for Ethiopian food. People I worked for on campus were always bringing in gifts, or taking us out for lunch or coffee because everyone was focused on helping you grow— sincerity and passion was just in the air! My first semester, I worked 5 jobs on campus because I really didn’t want to indulge much in the party culture. Out of the 5 jobs, there was only one that I continued to work on until the end of my college life— The Vail Series. Denison, my alma mater had a lot of donors. Correction, rich donors; who loved the college so much that they were happy to donate millions of dollars. Last year Denison Alum and ex Disney CEO, Michael Eisner spent his Mickey Mouse fortune on buying a football team in the UK and opening up a new arts building on campus . Like him, were Mary and Foster McGaw, who set up a recurring trust fund called the Vail Series that brought world famous artists to campus for a week long residency where they took masterclasses in music, dance, and even science classes. The week then culminated with a concert in the 900 seater Swasey Chapel. In my first year, Morgan and I worked as ushers. 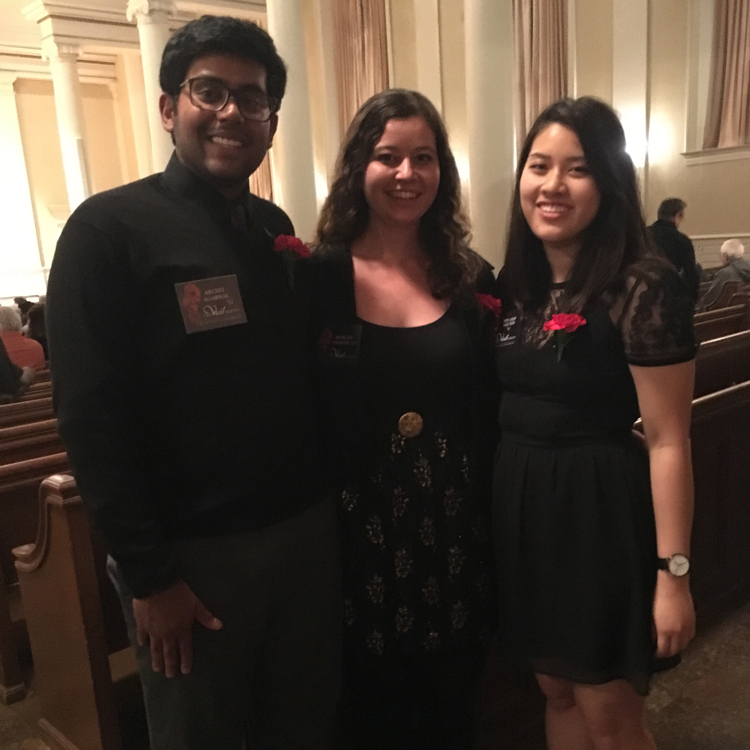 We wore all black formal wear, name-tags, and corsages and stood in the aisles of the chapel, helping patrons as they found their seats. By the third year, both Morgan and I were lead interns and with a team of 40 interns who helped produced every show with marketing, sales, and ushering. We lead team meetings and even got to introduce artists such as Bobby McFerrin, Chris Thile, and The Anh Trio on stage. This was by far the most creative and managerial job I had, which was only possible because our boss, Mike was so amazing. Mike was the director of art programming and The Vail Series was only one of his responsibilities. But this program was his (second) baby. He was so devoted to the show and to making sure us students felt valued. Every semester, he would host a brunch at his home for the 40 hungry college students that worked for him as interns and boy was it amazing. His wife, Connie and him loved to throw parties. They would make everything at home— from the garden salad to even bread. Each brunch was like a surprise with everyone guess what Connie and Mike had in store for on the the car ride to their house. The one thing that I absolutely adored were Connies chocolate chip and toffee cookies. They were the perfect balance of butter and sugar with semi melted sweet chocolate chips these toffee bits that would melt to a point where they weren’t completely assimilated into the cookie but melted enough to have that chewy snap to them. I pushed her to making them every time we met, to a point where we would get extras in goodie bags to take them home. What I loved about her cookies were their simplicity. Making them super simple lets two things come out very well— each ingredient could be tasted individually , and you could feel the love in each bite. Each bite felt like a warm hug by my mom (and a 100 calories) which is all that I expected from them. I never asked her for the recipe but since I have been back, I’ve had this craving for that warm hug. This recipe takes that idea of home and adds some more technique to them. Bon Appetit Magazine, makes one with some sea salt, and pastry chefs in India say that going with melted butter is a lot better than room temp ones. So after a lot of research and a multitude of temperatures, I have come up with recipe. I hope you do give it a try and send me pictures (I especially demand pictures from all those IG trolls that kept pestering me for this recipe. I. Better. See. These. On. Your. Feeds. ).